Today we are joined by a much loved author of mine Dinah Jefferies as part of her blog tour for her new release The Silk Merchant's Daughter, I had some burning questions for Dinah to answer. 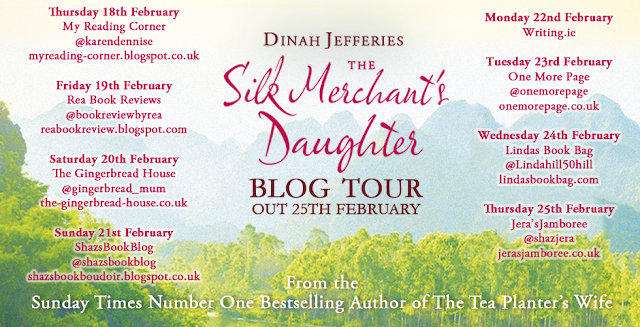 I have just finished reading The Silk Merchant's Daughter which is another stunning, atmospheric read Dinah which I greedily read in one sitting. Tell us a little about the research you took for this book. Thank you. I’m really glad you enjoyed it. I went to Vietnam, but before travelling there I read tons to decide exactly when and where to set the book: the history is complex and I needed to simplify it for the story to work. Uncovering the old French colonial world was challenging, particularly in Hanoi. Pollution, heavy traffic, and sprawling modern buildings have covered up the past and that meant I had to find old photos to inspire me. There were some truly gorgeous old French buildings but not as many as I’d expected and the best examples were on a fabulous tree lined street where the top Government ministers lived. It’s a communist country and unfortunately you aren’t allowed to stop the car anywhere in that street, so I only caught a glimpse of them. I did try to take photos through the window! All the way through The Silk Merchant's Daughter I didn't know who to trust and couldn't predict and how it was going to end which I also found with your previous two books so you do manage to keep your readers in suspense, do you have a clear beginning middle and end to your storylines when you start writing? You’d laugh if you knew the whole story behind this book. It began life as a three person viewpoint book, but I had to cut the first draft by 49,000 words because it was too unwieldy. Such an awful moment because that was almost half the book so I virtually had to start all over again, and in fact this book went through multiple changes. My next book, however, has a clear synopsis, with a clear start and a clear end. Not too sure about the middle yet, but it’s basically a book about destiny and the clash of cultures. I do know that. The Tea Planter's Wife was such a great success hitting the number 1 Sunday Times Best Seller spot, did you find this put extra pressure on you for The Silk Merchant's Daughter? You bet. It was a mad rush but luckily a large chunk of the manuscript was finished by the time Tea Planter did well. The hardest thing now is actually the time pressure to produce the next one! You have taken your readers on such cultural journeys in the beautiful locations in your books, how much of the plot do you already have planned before you go out to these countries or does a lot of the plot come to you on your visits? You know it’s different each time. For The Tea Planter’s Wife I already had the first draft completed and I only chose places to see in Sri Lanka that were already locations in the book. When I went to Vietnam I had the idea for the story but that was all and I had to rely on what inspired me while I was there. You have just returned from a trip to India for research for your next book which other places are on your list to visit and can you give us a tiny teaser of what to expect from book 4? I might go back to Sri Lanka, as I have a second story set in Ceylon at the back of my mind but beyond that I don’t know. Book 4 will be set in Rajasthan in 1930 when it was known as Rajputana. It will be an epic story about a recently widowed British woman and it will take place in a fictional Princely State. Fabulous forts and castles coming up! It’s a huge challenge and I don’t think many people realise how much research it takes to recreate a time and place that has long vanished. There are bound to mistakes and you just have to live with that and hope there aren’t too many. I do get letters from readers pointing out minor errors. I just sigh deeply because it’s too late to do anything about them. For me authenticity and atmosphere are crucial but I can’t guarantee 100% accuracy, though I really do my utmost. To have a number one Sunday Times Best Selling book is an ultimate achievement, do you have any other personal goals for your writing career? maybe a film adaptation? The goal really is always to produce the next book as well as I possibly can without going crazy! When I’m about to start a new book it completely consumes me but what happens after a book is completed is out of my hands. We all have different tastes and all like different books. You just hope people will buy it and that enough people will enjoy it. I was very lucky that Tea Planter was chosen by Richard & Judy as it gave the book massive visibility. A film would be lovely but they are terribly expensive to make, especially for the kind of books I write, but you never know. 1952, French Indochina. Since her mother's death, eighteen-year-old half-French, half-Vietnamese Nicole has been living in the shadow of her beautiful older sister, Sylvie. When Sylvie is handed control of the family silk business, Nicole is given an abandoned silk shop in the Vietnamese quarter of Hanoi. But the area is teeming with militant rebels who want to end French rule, by any means possible. For the first time, Nicole is awakened to the corruption of colonial rule - and her own family's involvement shocks her to the core... Tran, a notorious Vietnamese insurgent, seems to offer the perfect escape from her troubles, while Mark, a charming American trader, is the man she's always dreamed of. But who can she trust in this world where no one is what they seem? I am a huge fan of Dinah Jefferies and I loved both The Separation and The Tea Platers Wife, I still find myself constantly recommending these books to new clients who come into the salon. I have been eagerly awaiting the release of The Silk Merchant’s Daughter and when my copy arrived I was thrilled to see the cover still holds Dinah’s signature design. I have to hold my hands up and say I was actually a little apprehensive about this book, history is a big weakness for me ( hang my head in shame) and when I read the synopsis and had a brief look through the book to see each part was divided up into different periods of the French Indochina war I was a little worried that I would get lost along the way with this storyline having no knowledge of this war but as my journey began with Nicole I soon felt myself being pulled into the storyline and I was swept away with her on her harrowing journey. I actually felt as though Dinah Jefferies was educating me along the way as it captured my attention. It was so easy to connect with Nicole and I think that is because we go through the same thought process as her feeling trapped and not knowing who she could and couldn’t trust and where people’s loyalties lay. Nicole has grown up feeling like the black sheep of the family and not feeling the love and acceptance from her father and sister and to see her having to question her own family is a sorry state of affairs which really made my heart go out to her but she picks herself up and is determined to do what she thinks is the right thing. Her father gives Nicole the families old silk shop to run and it is here that she feels at ease and throws herself into work desperate to make a success of the business and show her worth. There are a vast amount of characters in this book who have all been well drawn but other than Lisa the cook and O-Lan I found I was just suspicious of everyone and was waiting for them all to put a foot wrong! Right up until the last remaining chapters I was still unsure of many of the characters motives. What I love about each of the author’s books is you can see the amount of research the author has taken and poured into her storylines which then help to make everything so believable and vivid in the readers mind. The author has such an exquisite writing style and a wealth of knowledge that shapes the storylines that I have come to love in her books. This storyline will have you embarking on a journey with Nicole as she has her heart captured, and discovers hidden family secrets which have shaped her relationship with family members and also been tested to the limit when she has to choose which dangerous path she should follow. This book did not disappoint and I can see this book easily joining The Tea Planters Wife in hitting that bestselling spot.